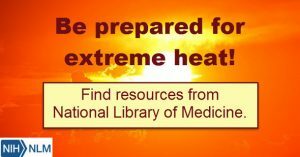 Check the “Extreme Heat Events and Health” page from the National Library of Medicine to learn best practices for preparing and responding to dangerously hot summer weather. Health issues related to extreme heat. Resources for specific populations (children). Health resources for the public.